Trifle is a great dessert to make to feed a crowd and it's so easy to make. 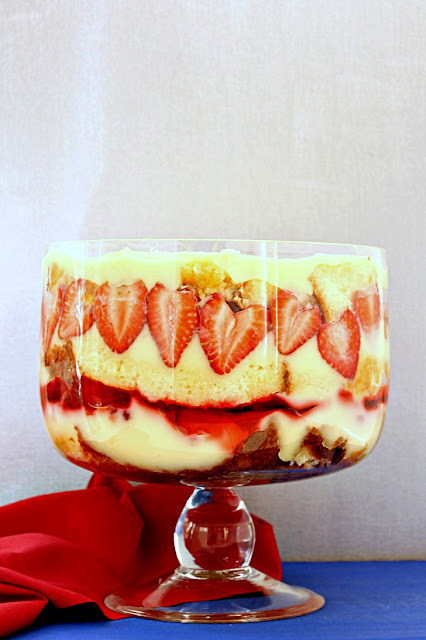 Growing up trifle always had Jello, cake, custard and fruit in alternating layers. To make this even easier, I used Instant Pudding instead of making a custard from scratch. You can buy pound cake but I chose to make my own cake and used this recipe without the pistachios. I baked it in a 9x13 pan. I had some cake leftover after assembling the trifle. I made this Trifle for a potluck. It was a hit with everyone and was almost finished by the time the evening was over! It's very easy to change the fruit and flavour of Jello to make different variations. Make Jello Vanilla Pudding according to the directions and refrigerate. Make Jello according to packet directions and refrigerate. If you are making the cake, bake it now. Slice the cake into 1/2 inch slices once cooled. Cover with plastic wrap and keep in the fridge overnight. Before serving, garnish with whipped cream and additional strawberries. Who doesn't like a good trifle! Looks delicious! Oooh now that's a trifle I would actually like to eat!! !